Hello Clockers.... how about a journey into the bin of the unpublished..... this post... the full post, eventually saw the light of day in a long long post.... but first... what never made it. Hello, welcome to the UFO Disclosure Countdown Clock (UDCC) - thanks for having an inquisitive mind and for finding this site and article. If you are new to the whole `UFO Disclosure' gig, or, even if you are a veteran - I want you to clearly think about some points that I am about to make regarding our government, UFO's and Robert Bigelow; the current headman of BAASS. Yes, this is the same Mr. Bigelow who is the wealthy visionary putting the first `hotel' in space. It costs 99 cents - and comes with other great UFO essay's too. The latest UFO find on the Red Planet was reported on March 27 by two YouTube anomaly hunters, Mars Moon Space Photo Zoom Club (MMSPZC) and Paranormal Crucible. 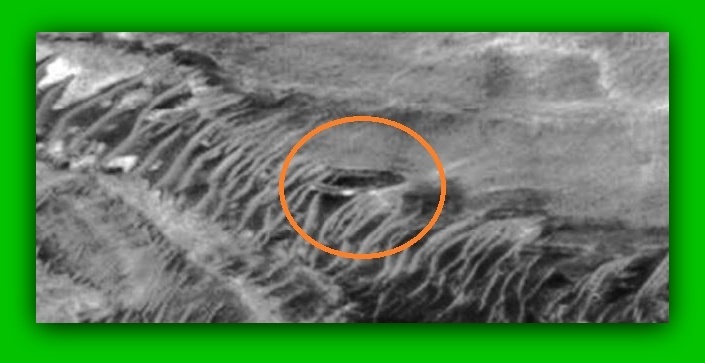 According to MMSPZC, the UFO flying saucer was discovered in images of the Martian region of Aram Chaos — 2.6°N, 21.5°W — near the canyon Valles Marineris and Ares Vallis. Doesn't pass the sniff test around here.... sorry. I mean WHAT ABOUT ALL THOSE BUILDINGS IN THE LEFT OF THE SCREEN? The undented crashed UFO...... (LOL) (cough) As Clockers know... the disinfo agents are desperate to continue the 2012 Folly in any manner they can. And often... one UFO website feels obligated to cover what others are touting as the new truth. Be wary. My thanks to the person who bought mega amounts of things on Amazon yesterday using my blog links. Thanks. And, an on-going thanks to the person at North Carolina UFOs who keeps interacting with that blog too.... your efforts are noted.